Over the weekend, an explosion completely blew off the wall of a one-room Kyoto apartment. The occupant was not seriously injured, and fingers crossed, neither was the limited edition Dreamcast game he owned. A nearby resident said the walls shook, thought it was an earthquake and opened his window to see a fire. TV Asahi reports that it is possible that the explosion was caused by a leak in one of the 5 gas cans that power a portable stove that ignited. The 35-year-old tenant made it out of the apartment with light burns to his hands and feet. "I fell asleep with the stove on," the man told investigators. As evident in the destroyed structure, the build quality doesn't seem to be of the highest order. For many years, especially after World War II and right on through the 1980s, buildings in Japan were thrown up quickly. The buildings from right after the war were of especially low build quality, due to scarce materials and an overwhelming demand for construction. They did improve, but it's still common to find even later buildings like this that seem to be held together with glue and gumtack. Another reason for the less than solid quality is that it was believed that a powerful earthquake would hit Tokyo and not Kansai (Osaka, Kobe and Kyoto), which is why stronger structures were built in the Tokyo area. Kobe, however, was hit by the Great Hanshin Earthquake in 1995 and many old, shoddy buildings fell in on occupants, often killing them. It was after this tragedy that the vast majority of the construction industry really began to take building very, very seriously, resulting in the sound, strong structures that are built today. 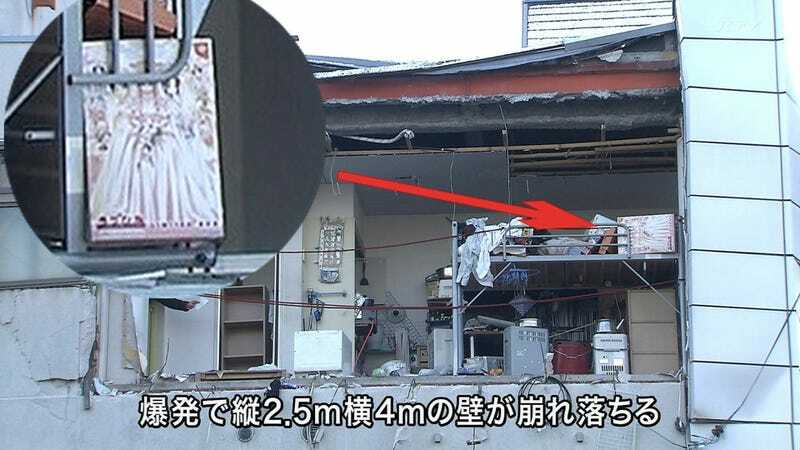 As serious as this explosion is and as dangerous as it could have been, Japanese netizens were quick to point out that in the tenant's room, there is a copy of Dreamcast love simulator Love Hina: Totsuzen no Engeji Happening. But not just a copy of the game, a limited version of the game, which came with a limited edition Love Hina wall clock, a Love Hina towel, a stuffed animal, a shrine tailsman for good luck. The box appears to be in tact, but no word on whether the game made it out okay or if the wall clock was affixed to the wall that was blown clear off. Love Hina was originally a manga, and it was quite popular, selling over six million copies and spun off into an anime. Besides the Dreamcast game, Love Hina was also turned into Game Boy Color and Game Boy Advance games as well as PlayStation and PlayStation 2 titles. Culture Smash is a daily dose of things topical, interesting and sometimes even awesome — game related and beyond.